In this high-stress, fast-moving, 24/7 world, it can be hard to get the brain to be quiet even for a minute. 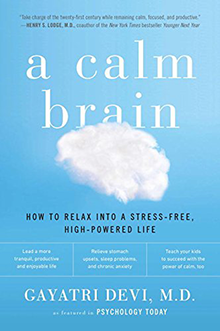 In A Calm Brain, Gayatri Devi unravels the neurology of stress and discusses how we can teach our brains to relax and calm down. Devi, a neurologist and professor, combines scientific knowledge with stories and practical, useful tips for seeking more calm in your life.